The monito gecko was discovered in 1974 on the Puerto Rican island of Monito. It is a pale tan lizard with dark brown scales appearing randomly on its upper side. Adults reach up to 36 mm in head and body length. Generally geckos are found in tropical rainforests, and they can only thrive in warm climates. Very little is known about the monito gecko's behavior. Geckos are unique lizards in their vocalizations, making chirping sounds when interacting with other geckos. Many gecko species have special pads on their toes that help them to climb a wide variety of surfaces, including glass, and even at complete 90 degree angles. Monito geckos may breed between March and November. Females may give birth to two to three eggs, and the eggs hatch after two or three months. Unlike most geckos, this particular species is mostly active in the daytime. The current monito gecko population is believed to be less than 250. 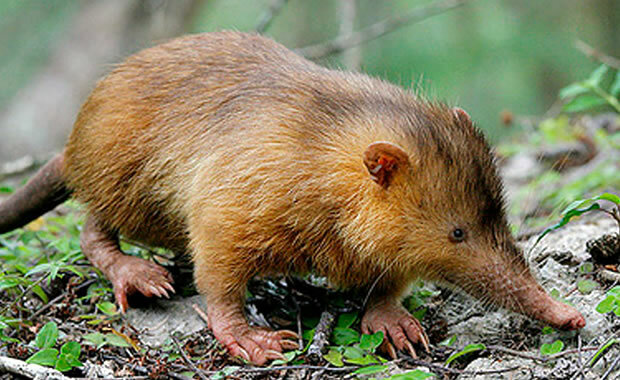 This species is listed as "critically endangered" and faces an extremely high risk of extinction in the wild. Causes of decline are believed to be predation by the black rat and habitat destruction due to human disturbance. Copyright Notice: This article is licensed under the GNU Free Documentation License. It uses material from the Wikipedia article "Monito gecko". Glenn, C. R. 2006. "Earth's Endangered Creatures - Monito Gecko Facts" (Online). Accessed 4/25/2019 at http://earthsendangered.com/profile.asp?sp=661&ID=9. Need more Monito Gecko facts?